True Indigo, Indigofera tinctoria. Fermentation of foliage produces a permanent blue dye reputed for the fastness and clarity. Also employed as a hair colouring. A popular, yet old fashioned, landscaping plant with a compact habit and attractive foliage. 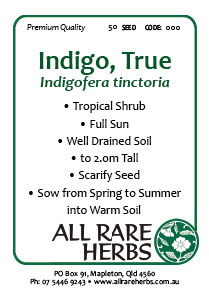 True Indigo is native to Asia and prefers fertile, well drained soils in part shaded position. Drought tender but frost resistant. A deciduous perennial, growing to 2m. Be the first to review “Indigo, True seed” Click here to cancel reply.